The Faculty of Management Sciences rolled out drums on Tuesday to celebrate the second substantive vice chancellor of the University, Prof. Pita Ejiofor as part of programmes to mark the silver jubilee (25 years of existence) of the faculty. The event which was held at the University auditorium and chaired by a former Minister of Health, Dr. Tim Menakaya was graced by the executive governor of the state, Chief Willie Obiano who was represented by his deputy, Dr. Nkem Okeke, the former National Chairman of the All Progressives Grand Alliance (APGA), Chief Victor Umeh, a former Secretary to the State Government and 2017 Governorship aspirant in the state, Mr. Oseloka Obaze, the chairmen Anambra and Enugu Council of Traditional Rulers, Igwe Alfred Achebe and Igwe Lawrence Agubuzo respectively, among numerous others. Welcoming the guests, the vice chancellor, Prof. Joseph Ahaneku stated that it is thrilling that Emeritus Prof. Pita Ejiofor is being honoured in his lifetime and during active service as Emeritus Professor by the institution of the lecture series which he noted hopefully, would run through the course of time. He described it as a well deserved and befitting honour to an erudite scholar, astute administrator and a social crusader. Prof. Ahaneku posited that Prof. Ejiofor has contributed immensely to the evolution of the Management Sciences discipline in the Nigerian University system. In his remarks, Dr. Nkem Okeke described Prof. Ejiofor as an enigma who is gifted and determined to make sure the Igbo language survives. Dr. Okeke commended Prof. Ejiofor for his doggedness in ensuring the language survives even at this critical time when the Igbos are having identity crisis. According to him, Igbos must begin to identify who they are, adding that the survival of the Igbo race rests on every Igbo man and woman. Earlier in his address, Dr. Menakaya eulogized Prof. Ejiofor, describing him as a thorough bred Igbo man, a born teacher that has turned out to become an eagle and great role model. The Dean of the faculty, Prof. Anayo Nkannebe posited that the event was in honour of a man who has contributed immensely to the enviable height the faculty has attained over the years. Chief Umeh described Prof. Ejiofor as a man of many parts who is astute in his fight for truth but quite unassuming despite his accomplishments. 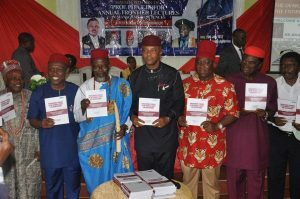 High point of the occasion was the unveiling and launching of a festschrift in honour of Prof. Ejiofor. Prof. Ejiofor in his response, was full of appreciation to the faculty and the university at large for the honour bestowed on him. Visibly elated, he expressed his gratitude to God for leading him this far and according him the grace to touch lives positively. He posited that he is highly humbled at the outpour of love and honour adding that if he has opportunities, he would still do more.